"Hereby know we that we dwell in him, and he in us, because he hath given us of his Spirit" (1 John 4:13). 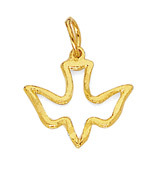 The Holy Spirit Dove Pendant in 14k solid yellow gold. Measures approx. 17mm wide (11/16") x 15mm tall (approx. 5/8"), with hoop/bail measures 19mm tall (3/4"). Approx. weight: 0.7 grams. We guarantee our 14K Gold Holy Spirit Dove Pendant to be high quality, authentic jewelry, as described above.